Two weeks ago Nike introduced their brand new Mercurial boots, Superfly and Vapor 360. The hype from the launch hasn’t settled yet, and now Nike is once again ready to blow us away. Get ready for the even faster black Nike Mercurial Superfly and Vapor 360! We understand if you’re having a hard time breathing when you’re reading this and looking at these beauties. There’s nothing like a black colourway. Well except for black colourways and chrome soleplates..! You might read this and think “This actually looks like something I’ve seen before”. Then you’re right. These beauties almost look similar to the Flyknit Ultra’s, but with some minor adjustments on the soleplate and upper. Looking at this colourway you can really see that Nike used the Flyknit Ultra as inspiration and used a lot of the things that worked, and used it in the new Superfly and Vapor 360. Something that just makes the boot even better! The boot is filled with details, and that might be hard sometimes when it comes to black colourways. 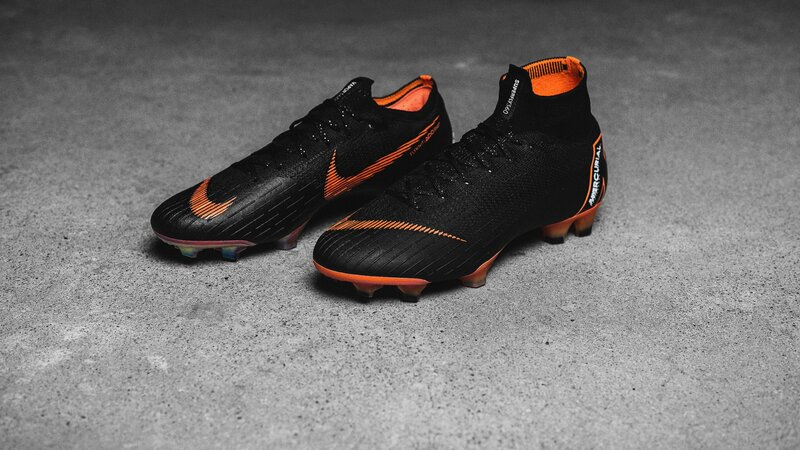 Though being a black boot, the new colourway still draws a lot of inspiration from the orange launch colourway. You can spot a hint of orange on the instep when stretching the boot. Furthermore glitter has also been added to the laces giving the boots the right Mercurial look. But it also gives the boot a complete design because it gives a similar effect as when looking at the soleplate. Speaking of soleplate, ouch! You might say the soleplate on the orange launch colour was astonishing, this boot just took it to the next level. Orange with a hint of pink, sounds like a mix that’s just after our taste. We mustn’t forget the M, which is visible on the heel due to an orange outline. The M will still be the last thing that defenders will see when you run past the, leaving them in the dust. Tech-wise the boot still features all the same technologies, so you get a full flyknit boot with ACC technology embedded in the yarn of the knitting. The modified cuff on the Superfly is similar to the one Cristiano Ronaldo preferred, when he used the older generation of the Superfly. These technologies all offer a better fit, which is the foundation of fast. Applying all these features into the boot will not allow you to slip around, meaning you won’t lose speed while acceleration past defenders. But speed will not be achieved without traction, and the studs on the forefoot will help with this. But if you get too fast, then the studs on the heel will help you to brake. All hyped and ready to get a pair? Then sign up for our newsletter and you will receive all the latest news on the boot and when you can buy it!